Monday 17th December 2018 – 5.10pm – Murray MacGregor. 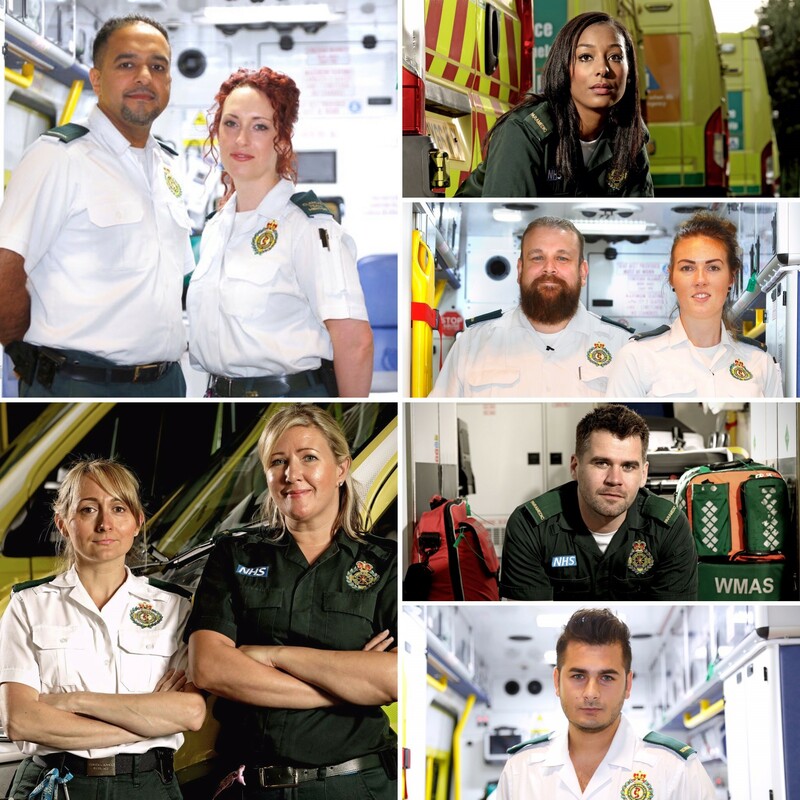 After the success of TV programmes like ‘Ambulance’ (BBC One), ‘999 On the Frontline’ (More 4) and ‘Inside the Ambulance’ (W Channel), a recruitment campaign to find paramedics of the future is attracting hundreds of applicants. Since the application opened on NHS Jobs, just over 13,000 people have viewed the job description and person specification. Not only that, over 1,000 people have started their application. But you don’t have long to complete the process, applications close on Christmas Eve. Recruitment Manager, Louise Harris, said: “There is no doubt that we have seen a huge level of interest in the role of student paramedic. Our social media channels on Twitter, Facebook and Instagram (@officialWMAS) have seen loads of people asking for more information. We’re also providing daily hints and tips. “It is great news that so many people have taken the time to look at the role. As an ‘earn as you learn’ scheme, it opens up possibilities to a wide range of people in the region. “We have seen people apply from all different communities and backgrounds but also a wide range of ages from teens to their 50s; many who are looking at a complete career change or even a third career. Applications close at 11.59pm on Monday 24th December. To date, 342 people have submitted their application with hundreds more midway through. To apply you need to have at least five GCSEs (A – C grade) including English, Maths and Science, and a single A Level in any subject. Equivalent qualifications will be accepted. In addition, you must at least have applied for you C1 driving licence. Tuesday 7th November 2017 – 5.20pm – Murray MacGregor. A recruitment campaign to find paramedics of the future looks likely set to set new records for the level of interest. Since the application opened on NHS Jobs, just over 21,000 people have viewed the job description and person specification. Not only that, over 450 have actually applied, with another 850 still working on their applications. Last December, a similar advert brought in 10,000 views and 28 applications. Recruitment Manager, Louise Harris, said: “After the success of TV programmes like ‘Ambulance’ (BBC One), ‘999 On The Frontline’ (More 4) and ‘Inside the Ambulance’ (W Channel), the ambulance service, particularly in the West Midlands, has never been so high profile. “There is no doubt that we have seen a huge level of interest in the role of paramedic and also those staff who work in our control rooms. Our social media channels on Twitter, Facebook and Instagram (@officialWMAS) have seen loads of people asking for more information. “It is great news that so many people have taken the time to look at the role of student paramedic. As an ‘earn as you learn’ scheme, it opens up possibilities to a wide range of people in the region. “We have seen people apply from all different communities but also people from their teens to their 50s; many who are looking at a complete career change or even a second career change. Applications close at 11.59pm on Thursday 9th November. To apply you need to have at least five GCSEs (A – C grade) including English, Maths and Science, and a single A Level in any subject. Equivalent qualifications will be accepted. In addition, you must at least have applied for you C1 driving licence. 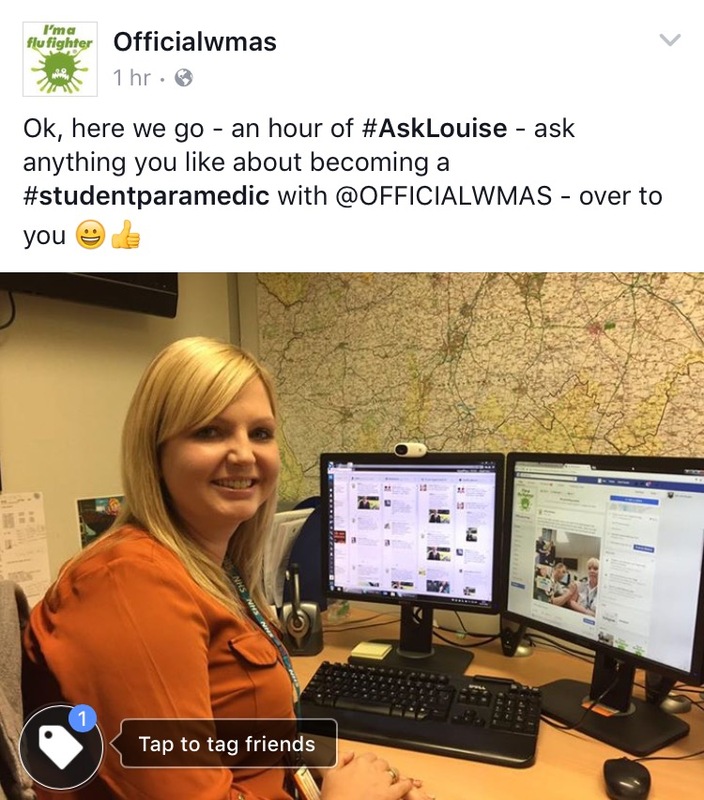 With a huge amount of interest in becoming a student paramedic with West Midlands Ambulance Service, Louise Harris, who heads up the Recruitment Team took to social media to hold an hour long #AskLouise session on Wednesday evening from 7.30pm – 8.30pm. In total she answered just under 50 questions, during the 60 minute session, that came in from Facebook, Twitter and Instagram. Louise said: “We weren’t sure how it would go, but the hour flew by. There were some really good questions from people who are clearly really keen to join us as a student paramedic. SOme were simple factual questions while others were asking much more details questions about preparing for interviews – I was impressed by that because it shows how committed they are to joining us. What is required to pass the fitness test? What five things do you look for in candidates? Where will students be working? What one thing do you wish applicants knew that they generally don’t already? Do I need to have applied for a C1 before I apply? How many points you could have on your driving licence? Do you need caring experience to apply? Wednesday 26th August 2015 – 8:50am – Laura Pitt. Do you prefer to see pictures instead of reading lengthy articles? If so, then look no further; West Midlands Ambulance Service has launched its own Instagram page. Laura Pitt, from the Communications team, said: “As a teenager, I know how popular Instagram is with my friends so it was natural for me to suggest that the Trust started using the site. “Although I have only been with the team for a short while, I can see how important some of the issues that the ambulance service deals with are to people of my age and younger. “Instagram is different to other social media sites as it is primarily based on photos with a short caption. “Many people my age aren’t interested in reading long articles, so by using Instagram, we can get important messages over to them, which ultimately could save a life. “If you follow our account @OfficialWMAS you’ll see pictures of everything from road traffic incidents, safety campaigns, things that our staff get up to whether it’s helping earthquake victims in Nepal or our Trust Mascot going to a school event. “In the few weeks since we started using Instagram, we’ve been posting pictures daily to make sure we keep our followers up to date. If you’re an @OFFICIALWMAS paramedic, you now only have two weeks left to renew your HCPC registration. If you’re late, you won’t be able to work as a paramedic. Don’t panic, as you can still get everything sorted in time. be late or you won’t be able to work. You can renew online now via this link. Tuesday 11th August 2015 – 11.30am – John Hawker. If you have ever suffered with a nosebleed, a laceration or an insect bite did you know what to do? We have put together three short films advising the public on what to do if any of these things happen to you. Paramedics from Warwick, Ian Inglesant and Will Tansey, have been on camera providing the public with some quick advice and tips on what to do. Area Support Officer, Ian, said “Should you be unlucky enough to suffer a nosebleed, a cut or an insect sting or bite, do you know what the best course of action is? By learning some basic first aid the public will hopefully be able to look after themselves and their family member. Monday 20th July 2015 – 10.20am – Chris Kowalik. With school holidays having started, West Midlands Ambulance Service is reminding children not to take the plunge in rivers, ponds, canals and open quarries. Information from the Royal Life Saving Society UK shows around 400 people drown in the UK every year and thousands more are injured.. Drowning is the third highest cause of accidental death of children in the UK. Throughout this week, on twitter and facebook, a series of short videos will again highlight the dangers of open water. They feature Gullet Quarry in Worcestershire where two people died two years ago and the River Severn in Shroshire in whose flast-flowing waters ambulance staff often train in order to perform rescues. If you want to cool off this summer, take a dip in water that is supervised by lifeguards. To see the videos, follow us on twitter (@OFFICIALWMAS) or ‘like’ us on facebook (officialwmas). Monday 22nd June 2015 – 8.40am – Chris Kowalik. As summer begins, West Midlands Ambulance Service is warning you of the dangers of unsupervised open waters such as rivers, ponds, canals and quarries. 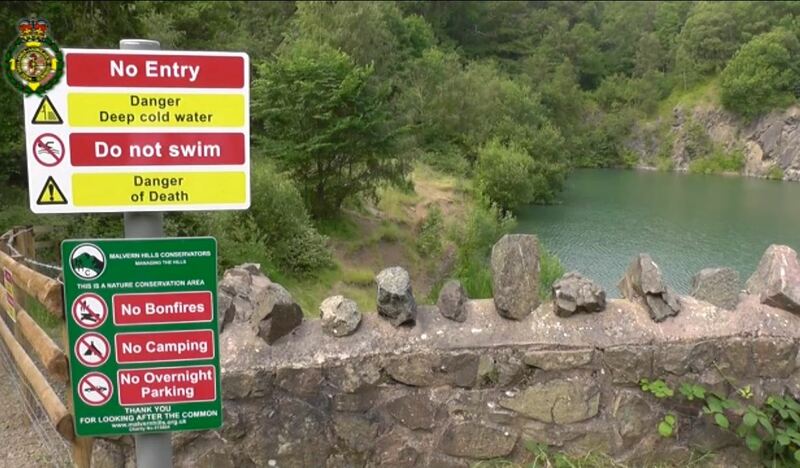 A week-long social media campaign will feature videos from Gullet Quarry in Worcestershire where two people died after jumping into the deep water two years ago. It will also highlight the River Severn, the country’s fastest flowing river, and the training ambulance staff undergo in order to perform water rescues. Information from the Royal Life Saving Society UK shows around 400 people drown in the UK every year and thousands more are injured. Drowning is the third highest cause of accidental death of children in the UK. The series of videos co-incides with the Society’s ‘Drowning Prevention Week’. Tuesday 10th February 2015 – 12.30pm – John Hawker. 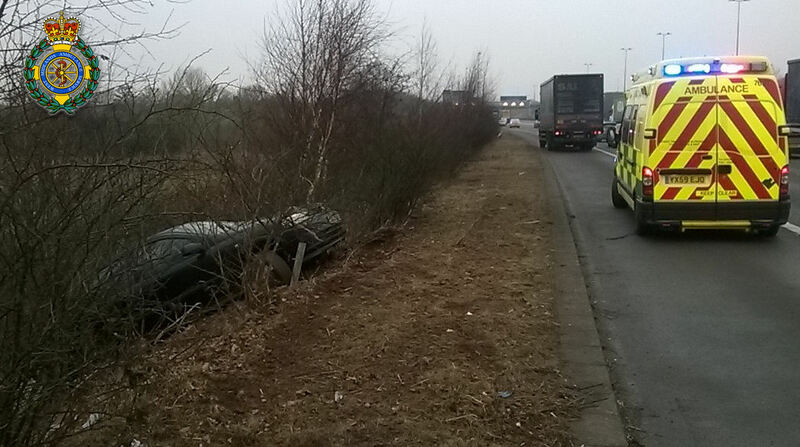 A mother and daughter had a lucky escape on the M6 this morning after being in an RTC. The crash occurred on the M6 Northbound, near Junction 3a at around 8.25am. An ambulance and a paramedic officer attended the scene. A West Midlands Ambulance Service spokesman said: “Crews arrived to find a car and a HGV that had been involved in a collision. 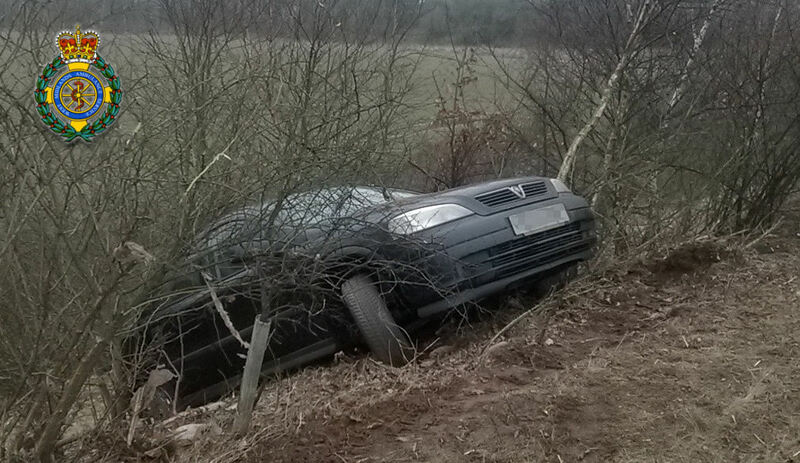 “The car had apparently ended up spinning around and going backwards down an embankment on the side of the motorway. “Fortunately for the two occupants the car came to a halt in a small coppice of trees and got wedged before it could go any further. “The woman driving the car, believed to be in her 30’s, and her teenage daughter, were both shaken up in the crash and were fully checked over by medics at the scene. Friday 5th December 2014 – 9.30am – Steve Parry. West Midlands Ambulance Service (WMAS) is one of the top three NHS Twitter accounts in the country according to analysis undertaken of the use of social media in the NHS. The Trust has been recognised in a new report: “On the brink of SoMething Special”, the result of 9 months research and analysis of NHS social media undertaken by leading consultancy JB McCrea, supported by NHS Providers. 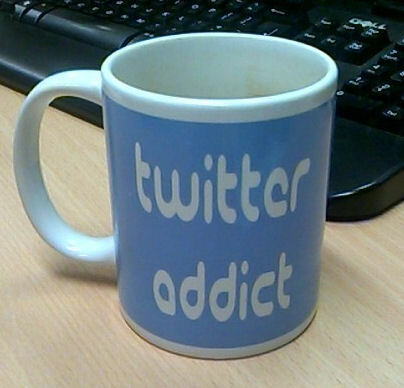 The Report identifies the top 50 NHS organisational Twitter accounts. WMAS was placed third overall but was singled out as the leading NHS Twitter account outside London. The Trust currently has a Facebook and WordPress page as part of its social network initiative. The Twitter account is also supported by over 40 official staff accounts providing additional tweets from various specialist departments in the Service. The Trust has almost 18,000 followers and has tweeted over 12,000 times since going live in 2011. You can join our top Twitter account by following WMAS: @officialwmas. Throughout this week, West Midlands Ambulance Service has been highlighting its concern with the rising trend of violence and abuse against its staff. The final video releases illustrates just one of the ways WMAS is dealing with the issue. All this week, the ‘Under Attack’ campaign has highlighted the problems faced by operational medics, ambulance bosses and trade union leaders who are now calling for tougher sentences for those people who attack and abuse ambulance staff. The number of ambulance workers being attacked, verbally abused or threatened while doing their job continues to be a ‘real concern’ with over 200 cases reported last year. Watch the final video presentations published today at: www.officialwmas.wordpress.com. Catch up by watching all the releases this week. You can also follow the progress of the campaign on Twitter and Facebook at:@officialwmas. “He pushed me back towards the ambulance. It was quite frightening. He had two of his friends behind him so we were outnumbered three to two. He hit me on my chest because I managed to move out of the way – and three times. It’s at that point, where things start to get a little bit out of hand like that, they you need to think about pushing your emergency button on your radio. This is a paramedic’s graphic description of how he was attacked by a bystander after having been called to tend to a patient in a car park. Sadly, his experience is not rare; attacks on staff are an everyday occurrence. The ‘Under Attack’ campaign highlights the problems faced by operational medics, ambulance bosses and trade union leaders who are now calling for tougher sentences for those people who attack and abuse ambulance staff. This is a paramedic’s graphic description of working on the frontline. Sadly, his experience is not rare, it’s an everyday occurrence. This is a female ambulance technician’s graphic description of working on the frontline. Sadly, her experience is not rare, it’s an everyday occurrence. Continuing for the rest of the week, the ‘Under Attack’ campaign highlights the problems faced by operational medics. Ambulance bosses and trade union leaders are now calling for tougher sentences for those people who attack and abuse ambulance staff. The latest figures released by West Midlands Ambulance Service show a depressing trend of violence and aggression against its staff. The on-going situation has sparked a call for tougher sentencing by Chief Executive Anthony Marsh and Unison’s Regional Organiser, Ray Salmon. The situation has also prompted a week of campaigning by the 999 service aimed at highlighting the issues faced by its staff. The hard-hitting campaign includes testimony from operational staff together with interviews with ambulance bosses and trade union officials. Follow the ‘Under Attack’ campaign all this week on: www.officialwmas.wordpress.com. Twitter and Facebook: @officialwmas.